The BattleBox Ultimate Liquid Cool Desktop Computer from CyberPowerPC is built for those who wish to be on the frontier of 4K gaming and multimedia. 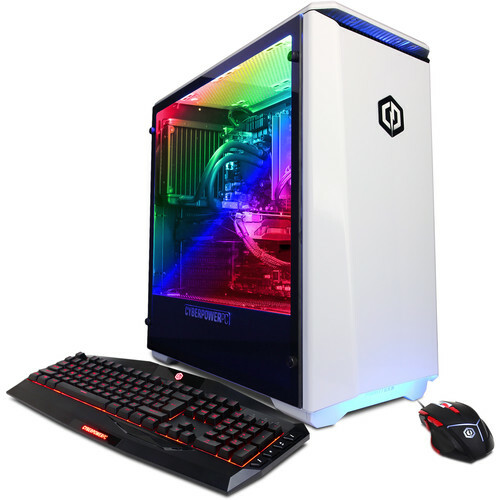 Powered by a 3.7 GHz AMD Ryzen 7 2700X eight-core processor and a NVIDIA GeForce GTX 1080 Ti graphics card with 11GB of GDDR5X VRAM, it can handle everything from everyday tasks to gaming at high resolutions and ultra settings. Furthermore, you can connect multiple displays using its DVI, HDMI, and DisplayPort for a multi-monitor setup. Its 32GB of DDR4 RAM lets you efficiently multitask and can be upgraded to a max of 64GB by replacing the pre-installed modules. For storage, it's equipped with a 240GB solid-state drive and a 3TB 7200 rpm hard drive. Should you need more room, you can connect external storage solutions using its multiple USB ports or by installing your own storage drives. Connect to the Internet using 802.11ac Wi-Fi or the Gigabit Ethernet jack for a more stable and reliable wired connection. The operating system installed is Windows 10 Home (64-Bit), and it comes with a USB gaming keyboard and mouse, so you can get started right out of the box. This CyberPowerPC is built in a Phanteks Eclipse P400 mid-tower case equipped with custom lighting. With it, you'll be able to swap through multiple colors to one that fits you best. Box Dimensions (LxWxH) 23.5 x 21.5 x 12.0"
How many mhz is this 32gb ddr4 memory? The memory is rated at 2400MHz. Please feel free to call us if you have any other questions at 800.707.0393.